After a week of in-processing, recruits have "pick up" day, their introduction to their drill instructors. During this event, drill instructors recite the Drill Instructor Creed, a vow to professionally train recruits to the best of their ability. Following the creed, recruits are given their first set of orders through a chaotic gear inspection. The intensity of the gear inspection is designed to set the tone for the remaining 12 weeks of training. —Marine Corps photos by Cpl. Tyler Viglione. MCRD San Diego. September 25, 2015. In the Marine Corps, a recruit must earn the title of United States Marine. A recruit is not a Marine when he or she enlists. A recruit is not a Marine when he or she steps on the yellow foot prints. A recruit is not a Marine until he or she completes the Crucible—the culmination of all things learned over the course of recruit training that occurs during Training Week 10. Upon Completion of this event, Drill Instructors will present recruits with the Eagle, Globe, and Anchor (EGA). So, until this time, always refer to your Marine as a "recruit," as he or she is not a Marine—yet. Likewise, your are not a Marine parent until your son or daughter completes the Crucible. However, you can share your pride that you've got a Marine in the making! You can absolutely wear Marine Corps attire, put out a garden flag, or display your pride in other ways. 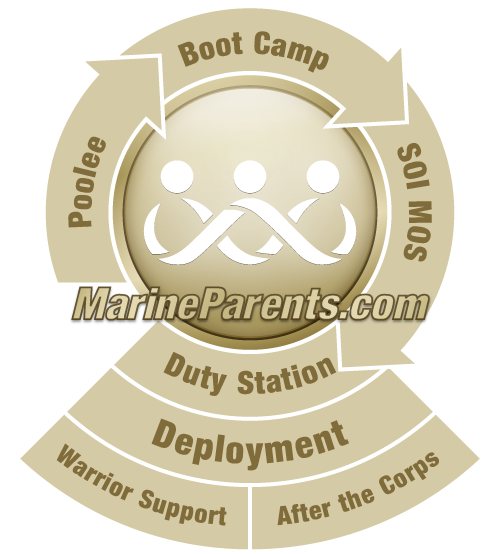 What you shouldn't do is wear anything that says "Proud Marine Parent" until your recruit becomes a Marine. The shirts pictured below are examples of the kind of attire to wear while your recruit is in boot camp. All proceeds of the EGA Shop benefit the outreach programs of MarineParents.com. We are officially licensed by the Marine Corps Trademark and Licensing Office to sell Marine Corps products. To learn more and shop for Marine Corps items, please visit the EGA Shop today! Enter coupon code SHOPAGAIN at checkout to save $5 off a $50 purchase. And thank you for shopping where you dollars support our troops! As we sit in front of the theater waiting for our recruit to become a Marine, I just wanted to say thank you again for all who make this site possible, it's been such a blessing!